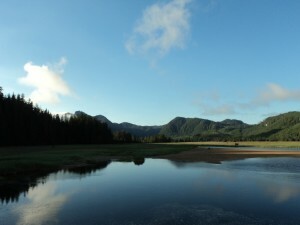 This is a story of a small place – a sandbar -, in a big place – the Red Bluff River -, in an even bigger place – the South Baranof Wilderness -, and, well, we won’t even get into the Tongass and beyond. Over a week of work in Red Bluff Bay this week, we got to know the area very well. 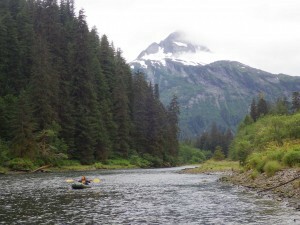 Three of our fifteen trip goals happened to require upriver travel, which we did on foot and by packraft. While upriver, we observed beavers, surveyed for owls and amphibians, and measured many giant trees, including a few spruce trees that were over 25 feet in circumference. The Red Bluff River’s productivity and diversity can be traced back to those giant trees; as they rot and fall they alter the course of the river, make homes for canopy and cavity dwellers, and open clearings for berries and deer. Sometimes, they create sandbars, and we decided to survey one of those sandbars in more detail. On this small patch of gravel and dead tree – also an ideal spot for salmon to spawn – SCS botany intern was able to identify forty-seven different species of plants, including the rare Mimulus lewisii, of which we collected a sample for genetic analysis. Mimulus lewisii, more often known as the pink monkeyflower, has a very interesting, patchy distribution that may be linked to receding ice and snow cover. 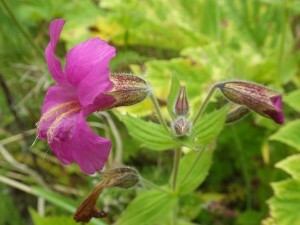 Here’s a close-up of the flower: may it inspire you to go for a stroll in the wilderness! And then ten minutes later, I’m out in the pit, my gloves wrist deep in the belly of a king salmon, no trace of breakfast in sight – not that I would be up for eating it if it was. The fish are pouring in over the side, and I think about my camera, laying abandoned in my bunk. Wasn’t that supposed to be my tool here, not gaff hooks and knives? What was I doing covered in fish blood and salt water, in the exact place that, at the ripe old age of 14, I swore I would never come back to? My dad has been a commercial salmon troller out of Sitka, our small town in Southeast Alaska, for the last thirty-four years. Other fisherman recognize me around town sometimes, stop me and shake my hand: “You’re Charlie’s daughter,” they say. “Man. Your dad knows how to catch a fish.” The last time he wore a suit was at his own wedding, almost twenty-five years ago: and his tie was shaped like a fish. I did my first stint as a deckhand at age eleven: cleaning and icing before I was actually strong enough to haul a fish aboard myself. My friends from the Lower 48 love this story, impressed by the romance of it all: this makes me feel a lot like I am deceiving them. And then the dreams started. I have always loved the visuals of Southeast Alaska: they’re part of why I became a photographer in the first place, but this was overwhelming. Three or four times a week I would close my eyes and I would find the ocean stretching out from the bow of the boat, salmon swimming through the air around me. I doodled salmon in the margins of my notebooks, wrote poems about salmon running upstream, essays on deckhands and sea lions. When I came home, I found myself photographing spawning salmon; the shape of fishing boats; the different colors of the ocean: it all rattled around in my mind, requiring my attention. 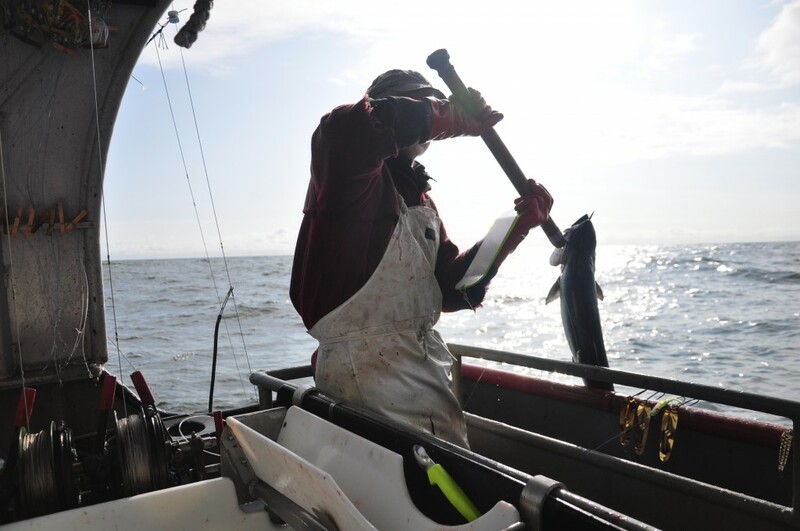 That question was the reason I found myself back on the deck of the F/V Alexa K, gutting fish before breakfast, back to the place where my grudge against salmon had been instilled in the first place. After eight days of work – cleaning, icing, photographing, and a lot of thinking – I still didn’t like fishing. But I realized that just because I didn’t want to slay salmon on the high seas, it didn’t mean that I could get away from them. The more I thought about it, the easier it became to justify why salmon were important to me, even if I wasn’t fishing for them: whether or not I had a gaff in hand, I was born locked in to the salmon cycle of Southeast Alaska. Salmon aren’t just my family’s livelihood. They’re the backbone of our local economy. 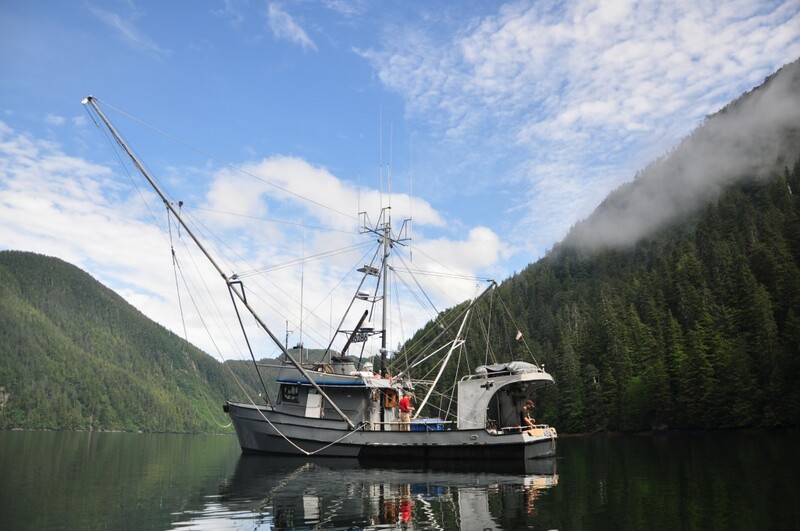 Southeast Alaska is the world’s most productive and valuable salmon fishery in the world. 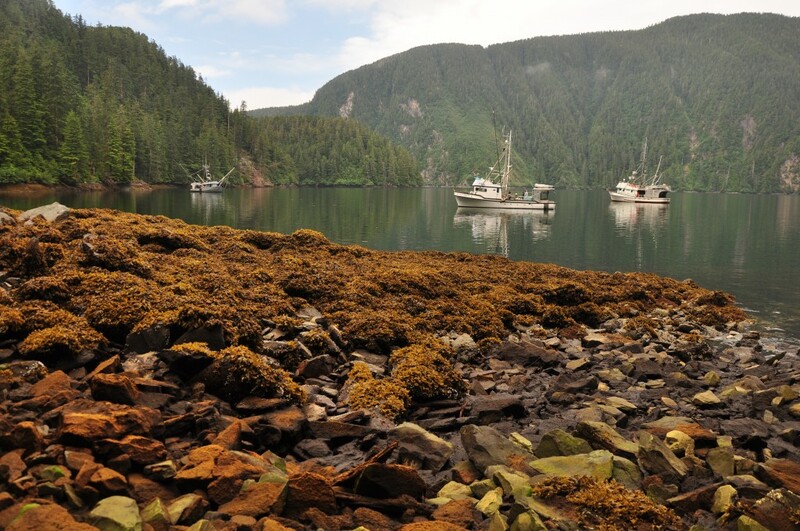 If you were raised in the Tongass National Forest, chances are you’re a newcomer to what has been the spawning ground of salmon ancestors for 50 million years. The influence of the salmon that die on the banks each year ranges so far it’s impossible to trace them to an end. From fertilizing the forest, to feeding the wildlife, even changing the chemical composition of the soil, dead salmon help create one of the most unique and biodiverse biomes in the world – and they feed everything from Alaska’s tourism industry to new generations of fish in the streams. 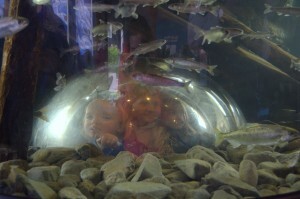 As a result, salmon are run deep in my conception of my community and my environment. There’s a connection I have to the forest and the ocean that feels just as strong when I am thousands of miles away as when I am asleep in a bunk that rests below the waterline of the Pacific. So while my dad trolls for bites and poundage, I look for shots and frames. I can’t make anything that would fill a freezer through the winter. 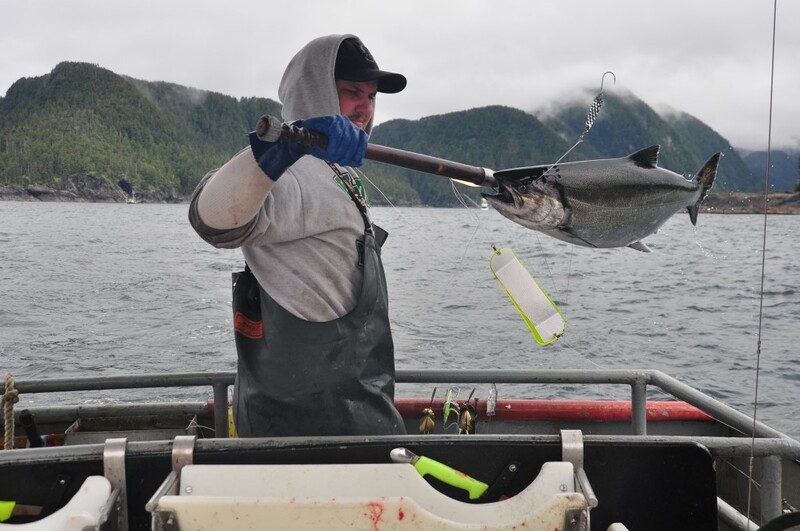 But I can still have an affect on the resources on which we both depend: I can share the stories of people who make the Tongass their home, who make fishing their lifestyle. People like my parents. My dad will be the first to tell you – nobody gets rich trolling for salmon. You can only succeed at it if you love it, because otherwise it would drive you insane. 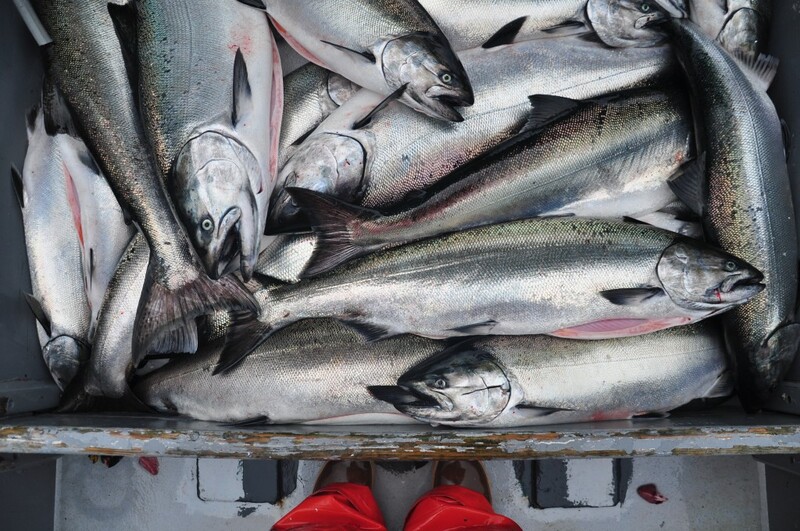 But there’s a reason that sustainable fisheries were written into Alaska’s state constitution: not only do we care about catching fish this year, but we care about being able to catch fish twenty or fifty years from now. The future of my family, and many families like mine, depend on the fisheries, which depend on the salmon, which depend on the forest. And it’s only by making these connections visible to the rest of the world that we can help protect them – to sway federal management of public lands, to make sure logging doesn’t ruin salmon habitat, to ensure sustainable catch practices. We’re one piece in an environment that has been raising salmon, trees, and people in conjunction for longer than anyone can remember. And even if we seem small in the face of all that ecological history, the importance that comes with being a link in that chain is not one we can take lightly. If everyone made the mistake that I made, if we considered the forest, the fisheries, even our families, disparate parts, each part would suffer the consequences. Which is why instead of struggling to get away from salmon, I now find myself arguing for them. I don’t need to spend all my days on a boat to know that any chance we have to show the connection between the economy and the environment, the fisheries and the forest, is a chance to preserve the place that has always been home. 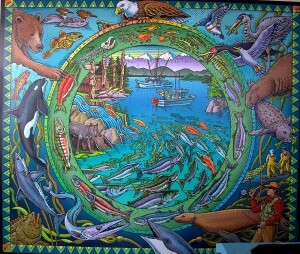 In Southeast Alaska, the people, the fish, and the forest share a future. Just because I’m the world’s worst deckhand doesn’t mean that I can’t help shape it. Out on the ocean, where we’re trolling past cliffs covered in trees, whose roots reach down to the rivers where the salmon spawn each summer, the sun is finally coming up. It’s likely that no one has ever set a foot on land here, but it doesn’t matter. Even without breakfast, even slightly nauseous, with water stretching to the horizon on three sides – it’s impossible to feel isolated. Because that’s what salmon do for the people of the Tongass: they make one the planet’s most remote corners feel like a home. On my trip to Kruzof, Scott Harris (SCS’s Watershed Program Manager) and I ATVed and bushwacked our way to artificial gaps cut in Kruzof’s second growth forest. These gaps are part of a program to restore wildlife habitat in logged forests, and we were monitoring the effectiveness of these gaps. An effective gap would be filled with shrubs like blueberry for deer to browse on, while an ineffective gap would be overrun with salmonberry or hemlock flush. After collecting countless scratches on our arms from crawling through the dense spruce forest to get to these gaps, we were able to draw some conclusions about the forest succession occurring at Kruzof. Where thinning of the forest or artificial gaps were cut, the forest was filled with shrub thickets, while moss, ferns, and forbs covered the forest ground. Thus, these artificial disturbances appear to be working as designed! They are providing space for the young trees to grow, while improving shrub growth. However, there is still a lot of unthinned forest on Kruzof and some of the gaps are filling in, meaning there is still a critical need for further restoration work. 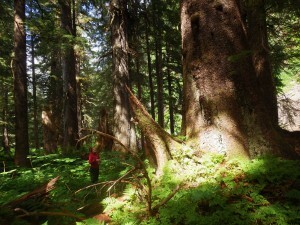 If restoration projects continue to be implemented on Kruzof and throughout the Tongass, we may be able to catalyze the establishment of healthy secondary forests. Logging Kruzof Island not only affected its terrestrial ecosystems, but the streams were greatly affected as well. 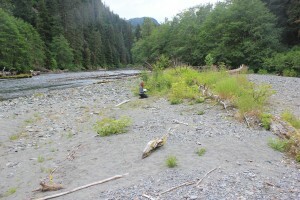 While streams running through old-growth forest are filled with fallen trees and root wads which provide great habitat for salmon, the streams we walked through in central Kruzof are deprived of fallen trees, leaving the salmon habitat highly inadequate. 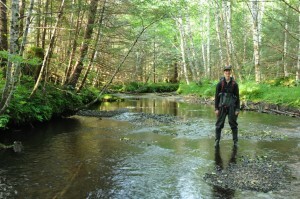 These streams offer ideal locations for future stream restoration work. They are located near trails used by Alaska ATV tours (among other users) and allow easier access to possible restoration sites, allowing more restoration work to occur for less time and money. In order to restore Kruzof’s terrestrial and freshwater ecosystems, trees must be placed into the streams and the forest should be thinned. Thus, the trees cut to thin the forest surrounding the streams may be placed into the stream. In this way, both the stream and forest may be restored together. 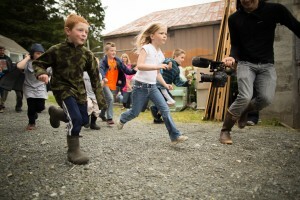 Alaska Way of Life 4H Summer Clubs! After a summer of exploring, examining, and identifying, kids in the Alaska Way of Life 4H clubs are walking away from these 7 week clubs will a whole new skill set. 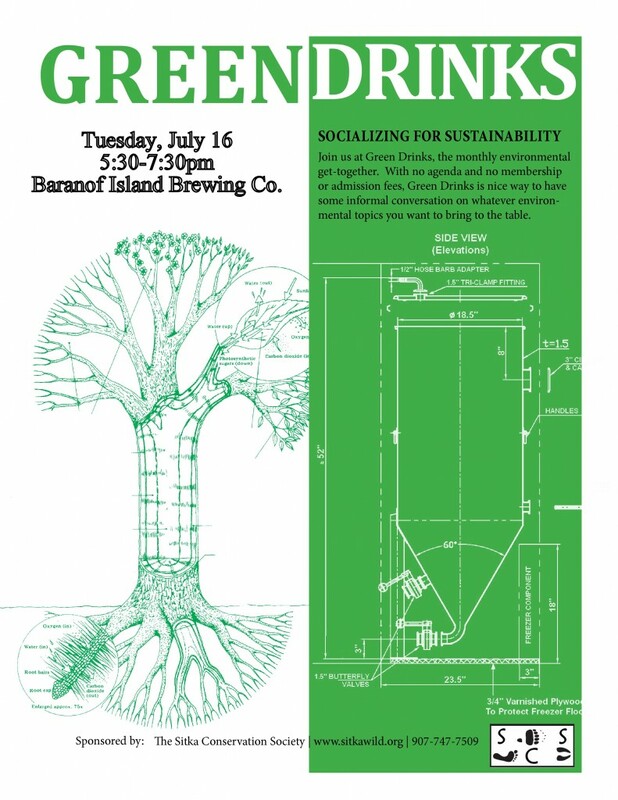 During June and July, clubs in gardening, hiking, and kayaking met every week to build community, interact with their landscape, and learn new skills. Gardening club spent every Monday at St. Peter’s Fellowship farm learning how to plant, weed, water, harvest, cook, and de-slug. Every Thursday we explored other gardens in Sitka to learn different gardening techniques. We learned how chickens are helping Sprucecot Garden, saw how bees are pollinating plants at Cooperative Extension’s Greenhouse, and the many different styles of gardening present at Blatchley’s Community Garden. Kids walked away a little dirty and wet, but with smiles and plants in hand. Kayaking Club incorporated more than just how to paddle a boat. We learned how to tie bowlines, clove hitches, and double fishermen knots. We had another 4H’er teach us how to build survival kits. Every kid learned how to use and put together their own kit to keep us safe on our kayaking journeys. 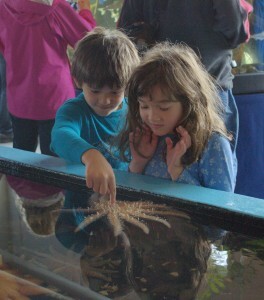 Rangers at Sitka National Historical Park showed us why we have tides and how they change during the course of the day. Finally, after weeks of preparation, 4H’ers learned how to put on gear, get in and out of their boat, and paddle before we took to the water at Swan Lake and Herring Cove. 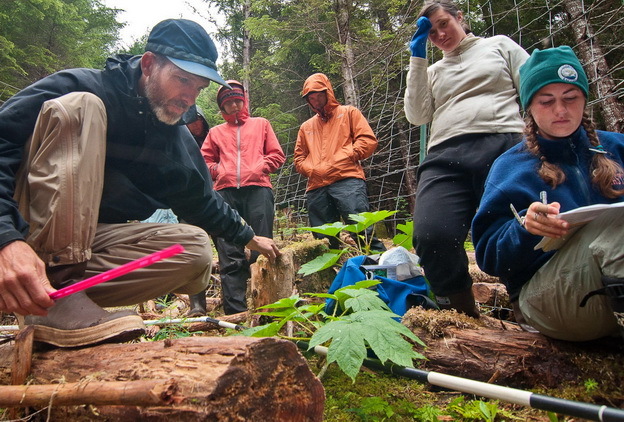 This summer’s hiking club learned how to interact with the Tongass in new ways. We learned foraging skills and how to properly harvest spruce tips and berries. We collected leaves and flowers and created plant presses to preserve them. The kids learned flora and fauna of the muskeg before gathering labrador tea leaves. For our final hike, we learned how to use a compass and GPS to find treasure hidden in the forest. Even after learning all these new skills, we made time to hike seven different trails in Sitka. Enjoy photos from the summer programs! For the full album, visit our facebook page. 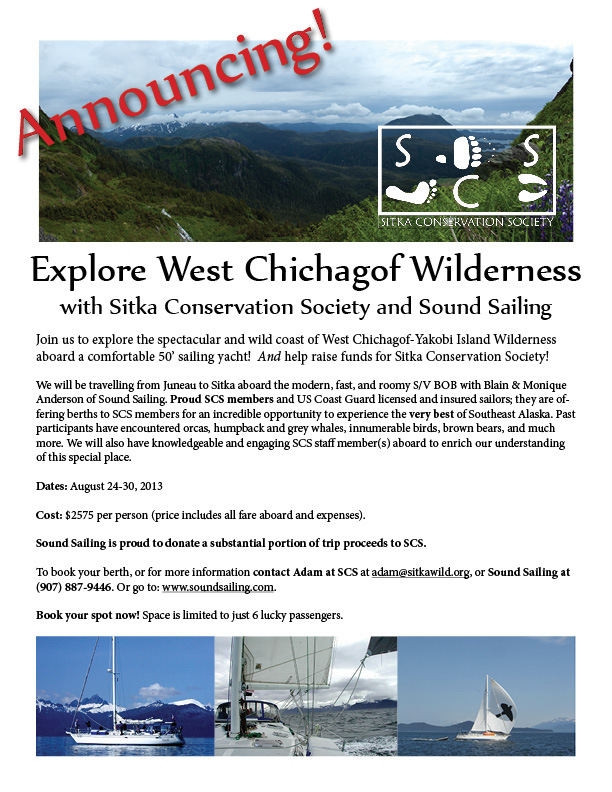 Join us to explore the spectacular and wild coast of West Chichagof-Yakobi Island Wilderness aboard a comfortable 50’ sailing yacht! And help raise funds for Sitka Conservation Society!